Pakistan ranks 80 amongst 122 nations regarding the quality of our drinking water. Although Karachi is situated on the eastern coast of the Arabian Sea, its residents continue to face a severe shortage of water. Due to the onset of summer, Karachites face an acute shortage of water because of the negligence of our ruling elite. It is tragic that ever since Pakistan’s inception, the authorities have still not been able to form a single policy that ensures a consistent supply of water. Unfortunately, neither of the strategies currently present can regulate the alarming water situation in our country; hence we continue to depend on unpredictable rains and our glaciers. Underground water is not suitable for consumption, which leaves us with lakes as a safer option. The largest metropolitan city of Pakistan – Karachi, gets its major supply of water from Keenjhar Lake and Hub Dam located on Hub River. Keenjhar Lake supplies around 500 million gallons per day and Hub Dam has the capacity to provide less than 100 million gallons per day, but it has reached the ‘dead’ level. Having said that, the demand for water in Karachi continues to escalate – estimating up to 1,500 million gallons per day. Due to technical errors, dams are unable to supply water to their full potential. This is largely a result of less rainfall and the depletion of underground water. No measures have been taken in recent years to uplift these lakes, in order to be used as an alternative source. Since 2011, it is presumed that the government has been allocating funds to the Dhabeji 100 MGD project ever year. But this project is yet to begin. Where exactly these funds are being channelled remains to be a mystery. It’s not just the government that is responsible for water scarcity in Karachi; its citizens are also actively playing their role in provoking this shortage. It’s no surprise that the water supply in Karachi is needed for domestic use as well as industrial and agriculture purposes. Farmers and industrialists in Karachi’s Malir district have propeller fitted pipes that are subject to water theft. A huge quantity of water is embezzled and this practice fails to be curbed, considering the lack of water meters installed to estimate water theft. Karachi’s residents tend to file complaints against this illegal procurement of water via machines because they are deprived of their due rights. Their taps run dry since they get water only once a week, yet none of these complaints are taken seriously and no measures are taken to accommodate the citizens’ woes. Moreover, the water lines in Karachi are often ruptured and the Karachi Water and Sewerage Board (KWSB) are busy repairing these lines all year round, therefore their energy is mostly focused on that. Almost 30 to 40% of water is wasted in leakages from busted pipes. The nexus between the Karachi Water Board employees and the tanker mafia is another reason for water shortage in the city. KWSB doesn’t mend these leakages thoroughly because they have to accommodate the water mafia of Karachi as well. At the end of the day, selfishness and corruption win over duty and responsibility. Most residents in Karachi have to call for water tankers at least once every week, for which they have to pay around Rs18,000 per month. That’s a hefty amount for water. Shouldn’t there be measures to subsidise water rates for citizens or have a check and balance for water tanker rates? Karachi’s tanker mafia has grown to become extremely powerful. Various illegal water pumps have been destroyed in the city – for personal gains – but not a single criminal involved in water theft has been arrested or detained by the rangers or the police. Continuous load shedding further helps the tanker mafia to expand their business. They get the water from KWSB’s main lines and sell it to residents who already foot KWSB’s monthly bill. The annual income of this notorious tanker mafia is reported to be around Rs40 billion, while KWSB’s total budget for the year 2015-16 is around Rs32985.886 million. During a recently held meeting of the provincial public accounts committee (PAC), KWSB was asked to provide a record of its expenditure, but they failed to do so. Moreover; the managing director of KWSB had apparently allowed an illegal water connection to a private beverage company, for which KWSB had invested millions of rupees. Hundreds of such discrepancies were unearthed by the PAC, but no legal action was suggested against those responsible. Could this be due to the fact that various government departments, including the governor house, the CM house and members of the provincial and national assembly are amongst those who don’t pay their KWSB bills? KWSB fails to provide water to upright residents who pay their bills, while individuals in positions of power receive an uninterrupted water supply even though they don’t pay their bills. Karachi households consume different types of water. 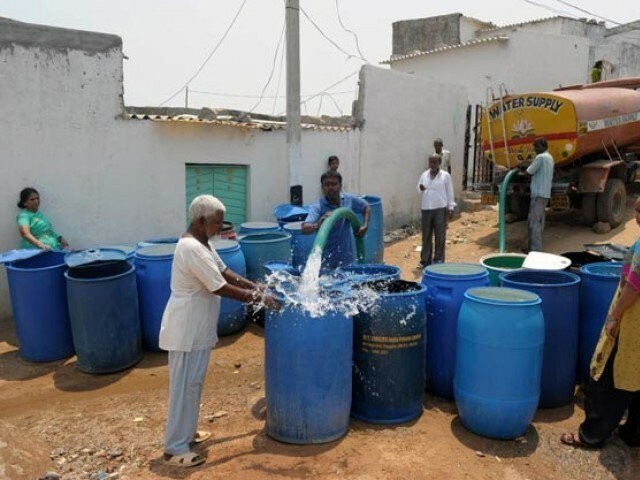 Meetha pani (sweet water) is the most common, which we receive through pipelines installed by KWSB, from the market or sometimes from the hydrants installed in our areas. The second type is khaara pani (brackish water) extracted from underground, but it is unsuitable for consumption because it is incredibly saline. Yet, a majority of the populace uses it. Then there is mineral water that is readily sold in the market under branded packaging, absolved of all minerals. A number of independent surveys suggest that bottled mineral water – which is believed to have 90% of minerals – is actually dangerous for our heath as it lacks the basic ingredients that make water safe to drink. What is more alarming is there is no restriction to stop such illegal water businesses. Karachi’s infrastructure is constantly expanding with the construction of new buildings, flyovers and underpasses. This increase is making the demand for water surge even further. If the government is serious about addressing grievances of Karachiites, then it should immediately halt any new housing schemes in the city. A check and balance should be exercised on hydrants. Old and ruptured pipelines that channel water should also be replaced with new ones. A policy for water distribution should be formed for the entire country. There should be some kind of measure taken, specifically in agricultural arenas, in order for water to not be wasted. Metre bills should be introduced so anyone who uses more water than is needed should duly pay for it – this specifically applies to the elite. Pakistan is at the edge of becoming a country facing water scarcity, thus, the concerned authorities need to take quick and effective measures before we become a parched land.